When President Nixon arrived in Moscow on May 22, 1972, the prospective results of his trip were all but predictable. Although the existence of the US-Soviet summit proved that both governments were prepared to open a new dialogue, most remained skeptic about the possibility of any agreements emerging from the planned meetings. The President spent a little over a week inside the Soviet Union, traveling to Moscow, Leningrad, and Kiev. He spent twenty hours with the Soviet leadership, and, more importantly, sixteen of those hours were dedicated to direct conversations with General-Secretary Brezhnev. American and Soviet representatives discussed issues that spanned the globe like the Vietnam War, European security, unrest in the Middle East, and arms control, as well as bilateral economic and diplomatic concerns. 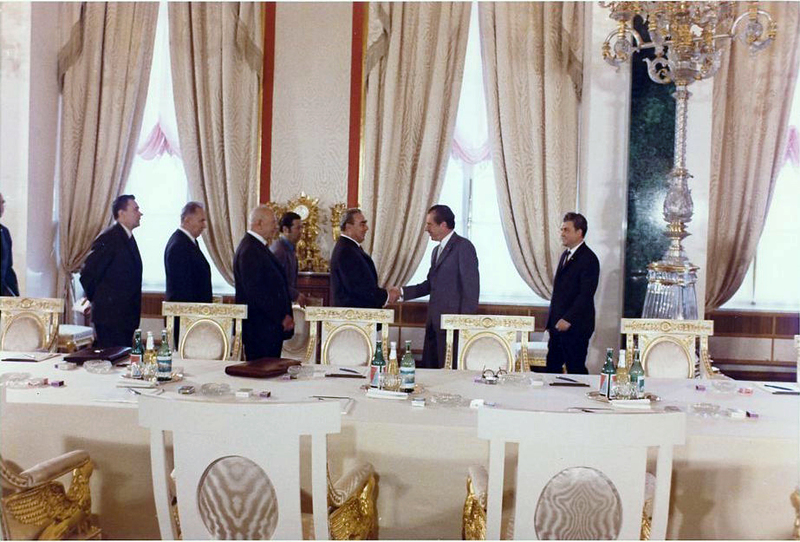 By the summit’s end, President Nixon and General-Secretary Brezhnev reached five mutual understandings regarding pollution and the environment; science and technology; medical research, space exploration; and international trade. They also signed the “Basic Principles of Mutual Relations between the United States and the U.S.S.R.,” which outlined practices for future bilateral negotiations and indicated an anticipation for future cooperation. In their intense discussions, Nixon and Brezhnev negotiated solutions to the final problems plaguing SALT. The Strategic Arms Limitations Talks formally commenced in 1969, and progressed slowly and with mutual frustration over the next three years. On May 26, 1972, Nixon and Brezhnev signed the Anti-Ballistic Missile Treaty and the SALT agreement. President Nixon’s visit to the Soviet Union was historic not only because it was a presidential first, but because the summit demonstrated that high-level meetings could produce substantive results and bring the interests of two polarized nations closer together.